Implied Volatility Rank (IV Rank) of NSE Futures & Options Stocks. IV Rank, IV Percentile and Implied Volatility of FNO stocks are listed in the table. IV Rank is ranking of current IV in relation to the one-year high & low IV. IV Percentile is the percentage number of days over the past one year the IVs are under the current IV. IV Rank & IV Percentile are now calculated over one-year data (52-weeks). If you are going to use IV Ranks and IV percentiles in your options strategies, please stick to just IV Rank or IV Percentile but not both. The IV vs IV Percentile chart helps in getting a quick glance at options underlying with high premium. The farther right and farther up on the chart the higher the option premiums of the underlying stock. FNO stock showing high IV percentile but very low IV are usually very illiquid and hardly trade, so be cautious. Zoom in and out of chart to find the stocks of your interest and find what their option premiums are. Click on the stock symbol to go the Implied Volatility chart of the stock. Note: Please do check out Options Dashboard, an alternative visualization tool for IV, IV Percentile and IV Rank of Nifty FNO Stocks. You can filter underlying stocks based on liquidity, IV percentile and upcoming earnings results. Posted in Apps, Futures, Options. I understand the IV rank and IV %ile, but how is the IV calculated here? IVs are calculated from IVs of At-the-Money and two Out-of-the-Money strike put & call options. Hi RiChie, agree. But the Indian stock options are not very liquid & therefore taking weighted averages will skew the IVs a lot. I would agree with you on the liquid stocks though. Have to see, if I can implement it partially for liquid stocks. Actually my back-end DB didn’t get updated last 2 days, so its showing data from 22nd. I use 2 different scripts for database & plotting table. The plooting script took last available data and extrapolated it. Fixed it now. Thanks for pointing out. some or the other keeps cropping up that one can’t imagine at the time of coding. So constant feedback from users is good, so I can update the code accordingly. Cool…Yes, I know…any algorithmic code (low frequency here) is a moving target….BTW: in my experience, pure IV Rank based trades in Indian stocks really does not seem to work…liquidity is very poor and delta invariably weighs over vega. Pure VIX is a better option. I use IV percentile based trades & they work fine. If you are doing vega trades (like calendars) this may not be ideal but otherwise other strategies like strangles, staddles, ratio spreads etc work fine. First of all I would like to appreciate your efforts for this excellent tool. Sometimes I found that it shows wrong IV. I think If you consider only ATM options IV then it could be more accurate. If possible kindly add real-time IV update. Once again thank you so much for this useful tool. Just FYI, IV is more accurately reflected in OTM options rather than ATM/ITM options. First of all, great work…kudos! Another query – is there a simpler way to get the entire NSE option chain for every stock in a csv file or through web download directly into python? I consider 1ATM & 2 OTM options (if available). Calculation is fine except that I don’t do weighted average, I do simple average. Use requests module in python to get option chain. Can you please elaborate on which http/API should I call? Thanks Raghu, I reckon this needs to be pulled using a loop with only symbol value at the end of url changing. Will you add IVR and IVP for Bank Nifty Weekly, it will be so useful. No. It can get complicated with weeklies. Any was to sort data as IV Rank instead of pre-sorted IV Percentile? Thanks. Now made the table sortable. Any reason Bank Nifty and Nifty isnt included in this list? 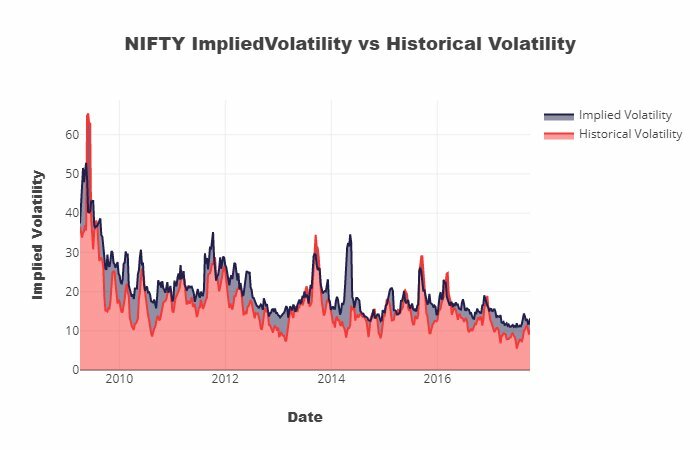 India VIX should do it for Nifty & more or less it gets reflected in BankNifty as well. This is very helpful… Good Job Raghunath. Something similar to what I have been working on. Selling IV and earnings play are two areas of primary focus for me. You have already built a lot of things that I had in mind. Great work. You can also calculate IV similar to how VIX is calculated for NIFTY. I have tried that using Python. With a few stocks overlapping with your list, here is the list that I have as of 23rd May. Of this, the tradeable ones would be only the following I think because of the liquidity. Also LUPIN figures at 54 IVP in my table. Great stuff. There will be difference due to options models I use to calculate IV from options price. I use Merton model. Ok. I am using the one from this link https://www.cboe.com/micro/vix/vixwhite.pdf. Apparently tastytrade also uses this. I don’t know how you are calculating but with our illiquid stock options its very difficult to use that CBOE VIX formula. Could be the reason why my values are so different. I am applying the same CBOE VIX formula for the stocks as well. So I take only the ATM options ? VIX formula will take the front month, next month & other month options into consideration as well. Not possible for our stock options which don’t have liquidity in next month expiry. I use ATM + 2 OTM call + 2 OTM Put IVs to calculate the stock IV. You can use Vollib or Mibian python libraries to calculate IVs. Thanks Raghu. I will try something similar. I could get NIFTY IV values very close to VIX with the CBOE VIX method. However with stock options, like you said, liquidity messed up my values. So do you average the individual IVs from each strike price to get overall IV for the stock? Sorry too many questions. But am amazed to see the things you’ve already done. yes. I average them. I’ve done this 2 years ago but able put on the web only now. Looking for a solution for option pricing as i follow BS model , and as per this i need Strike Price , Spot Price , No of days to expiry , Rate of Interest and finally the Implied Volatility Percentile for that particular Strike Price . For An example if nifty is trading 9780 and i can easily find the the price for nearest strike (Ie 9800) from NSE website , However if i want to calculate for the price for a strike of 9790 . Is there any solution available ? . Kindly suggest . Also, are there any python libs available to calculate IV like the way you are doing? Thanks a lot for this table , GOD bless you ..Could you please include historic IV rank and historic IV percentile rank as well..?? It would also be good if you can display historic IV rank data, will that be possible?. Would IV rank for indicies be possible?. Yes, will add another panel for IV Rank on charts. For indices IV rank not possible. For nifty use – India VIX. Do we have different ways of calculating volatility ? if yes then every one will have different volatility figure then how to decide which one to follow ? yes. some people use different option modeling methods like Black-Scholes, Merton model etc to calculate IV. Here I used Merton model, where the option price is pegged to futures to calculate the volatility. There will be some minor variations & small changes in IV numbers. Just stick to any one method & you will be fine. Why have you stopped updating the data? No, it’s updating. Check the timings in the post I mentioned. It will update every market day at 7:30 PM. Calculations take time. I have been following the post and its data for past 1 week. The dates are changing but the values are not. Kindly check. Thanks a lot for pointing out. Fixed it. Check now. I am of the opinion that the value of data will increase multifold if one or two columns are added in respect of total volume or no of options lots traded or total oi of call/ put options or both. This information can be extracted from options chain. I partially agree with you. Instead of the volume of the options traded, I will include liquidity of the options in the form of stars. That will also serve the purpose. Kindly ensure tbat we can arrange stars in acending / decreasing order. Great work. This is one of best website I came across for IV. Thank you very much for this. I have one question, when we talk about IV then it is different for different strike price of a single stock, then what does IV (last column) is representing here. And can we get same data for different strike prices? Thanks. IV is different for different strike prices. I calculate stock IV by taking an average of them. The data has not changed again. Its the same as yesterdays. Its fixed now. Thanks for pointing out. Will see updated list later in the day. There are other 48 Option underlying scripts which are not in the list so request you to add other missing scripts also. Those underlying scrips doesn’t have 6 months history in FnO. We need 6 months history to calculate IVP or IVR and therefore not in the list. Still awaiting inclusion of liquidity of the options in the form of stars. I have been searching for this information on NSE for years. Thanks a lot for providing this. This is great work. Please keep up the good work. Just one question, how do you get the option data ? Is there any free data sources for NSE option data ? Thanks a lot. But how do we get it for computing the IV rank ? Is there any APIs for that or need to scrape it ? Hi Raghunath, can we have real time IV rank and IV percentile (during market hours). Please also include liquidity of options as stars, to enhance the value proposition. Thanks for reporting. Its updated now. Liquidity thing will take some more time. You have done a wonderful work by taking off the major work from traders shoulder. I am not sure, if you have come across “optionsalpha” site. That guy build a tool similar to yours but added EFT’s and Earnings Only parameters along with your data parameters. I am basically a professional web developer and trader by passion. I was looking like for a while and working hard to build similar to this. By God grace you have already completed most of tool which simple and effective ????????. Good Luck!! How are you calculating the IVR and IVP? Do we get historical IV data on NSE website? Whether liquid options of the next month series are considered, prior to shortlisting is done by your algorithm, particularly in the last week prior to expiry day. This will be useful, as the gamma risk is high in the last week of current series for sellers, and sellers would prefer to look good strategies with high pop and roc in the next series. What is the value of annual interest rate is taken in computing I.V.values. The nse website takes 10%, however imho it would be prudent to take about 7-8 %, which is long term yield for long dated securities. I don’t use interest rate, instead I use future price to calculate IV as it already captures the interest rate & dividend rate. Hi Raghu, is there a way for me to download the hist iv data for the last 6 months? Not avialable publicly. What do you need it for?. Thanks for sharing this. As per my understanding after reading above replies, you are calculating IV’s using 1 ATM call and put IV and 2 OTM call and put IV. For e.g. for 06th oct yes bank closed at 365.8. NSE option chain IV data for 365 ATM put option is 32.31 and 364 and 360 OTM put is 32.94 and 32.4. Similarly for call option ATM IV for 365 is 29.81 and 368 and 370 option is 29.84 and 30.08. If I average this 32.31+32.94+32.4+29.81+29.84+30.08/6 I get 31.23 and above table shows 32.32. Please let me know if I am doing something wrong here. Also, for calculating probability of profit of option expiring worthless(like tastytrades), should we use IV or historical volatility of underlying? I am new bee and hence trying to understand this based on your trading experience. Calculation method of stock IV is right but I calculate the individual IVs of the options using a method different from NSE. For POP calculation I use IVs. Thanks a ton raghu. Would you like to share your IV calculation methodology? Is there any way to calculate these for Indices banknifty, nifty, etc. It has to be done the same way. You can do it for Nifty in excel using India VIX. For BankNifty, IV needs to be calculated. Raghunath – first of all a big thank you for providing IVR and IVP. I have not found it anywhere for Indian options anywhere so far in my search. 1) What is your IVP range of medium volatility and high volatility ? 2) Can you also compute IVP/IVR for indices also (NIFTY/BankNifty) – I know you mentioned VIX should suffice the need but it makes sense to also include them in your table and see how your computations and VIX are moving. I consider IVP above 80 as high volatility and between 50-80 as medium volatility. I will include BNF in the list. 1. Will you compute weekly BNF IVP/IVR … i.e. immediate next expiry? Your feedback is highly appreciated. 2. Also can you tell me little bit more on VIX. Is the value of VIX is the expected volatility (1 SD) for next 30 days only or it is the annualized value (assuming we are seeing it on daily timeframe) ? Not going to calculate weekly IVP/IVR. Only daily IVP/IVR. Excellent … so the IV value “Implied Volatility” column will be 1 SD annualized value of index .. is my understanding correct? When will you start publishing BankNifty IV? I use existing python packages like Mibian & Vollib to calculate the IVs. And to calculate IV percentile, use the formula I gave in this same page at top. sir how to get python package Mibian?. I have down loaded python. but do not know how to proceed,can you guide me? I think what we calculate is static volatility , some people calculate real time volatility. would like to know how real time volatility is calculated ? I have downloaded Vollib zip file . How to import in pycharm can any body help me. can we calculate IV rank or percentile of the same day on an hourly basis using this library? You can if you have real-time data available. in vollib which model you use for calculation.? What is the diff between Mibain and vollib calculation.? Require your help to understand the concept. So how do you calculate this, do to take the days implied volatility and measure it against the historic annualised volatility? i.e ((todayiv-52weeklow annualisedV)/(52week AnnualisedV-52weeklow AnnualisedV))*100 ? is that it, because how do u get historic implied volatility for a year ? Sir it will be great help to us. Can we have CALL IVs and PUT IVs columns as well? The data and date has not changed. Its the same as yesterdays. Please also include liquidity of options with sorting as stars or number of atm or all options traded, to enhance the value proposition. Data is updated. Reload and check. on 02.01.2018, the IVP and IV for Reliance are shown as same readings as one day before. Also, nifty IVP is zero and IV is 1.81. These values might be wrong. The data has not changed over yesterday. The values are same. Only the date has changed. Request you to please look into the matter and update. Jadelizards are more profitable when puts are more expensive than calls, usually when stocks gets beaten down. With bull market Jadelizards doesn’t have good POP. Many thanks for the explanation on Jade lizard POP. Was just going through this IVP/IVR data. Brilliant work and it needs an even bigger heart to put it out on public domain. I would like to know more about how to use this data for options trading! Any good book/material that u recommend ? How do we use the the various IV of different strikes in putting an option transaction? Should we use only the stock’s IV rank/IV percentile or is thr a way to use the individual IV of different strikes also? 1.Have you covered the Long Box /Short Box strategy anywhere in ur site? 2.My specific query is..is it possible to put in all the 4 legs of the strategy on the same day or do we have to build the strategy over a period of time? 3.Do you intend including it in your Option strategy builder? Never done a box strategy. Option strategy builder is to build the strategy. So, go ahead and select the options that are required for you strategy and submit to generate the pay-off for the strategy. Are the numbers zero today because the script has picked up data from Friday which was a trading holiday? Thanks – this is a very useful reference! yes, it will get fixed in the evening when we get today’s data. It would be a great help if we can somehow also have an indicator on liquidity (may be based on diff b/w bid and ask OR OI numbers). Is it possible to include in your daily table? today IV is appearing as 0 for all the stocks..
Hi Raghunath, will it be possible to provide realtime IV, IV rank and IV percentile for F&O securities. Currently we get the updated report only by 7PM. Thanks Raghunath, can you please explain how the Implied volatilities are calculated, any third party package? Today’s and yesterday’s IV are not updated. Kindly check. Amazing work. Hats off to you. One suggestion, please provide export to excel functionality where table are list. This will enable data for more re-calculation and analysis purpose. Sir How can I calculate call / put strike Specific Implied Volatility of Past expiry? there Are site offering calculator but It doesn’t allow 0.5 , 0.75 in Days to expire If I want to calculate IV on Last day of Expiry. Also Nest / Now also doesn’t let count IV of Past contract. So Is there Any other way ? You can use python packages such as Vollib or mibian to calculated the IVs even with fractional days. 1. thats really a great stuff…this site has made my work a lot easier..do u hav any plan to launch any android app to show index and stock greeks and iv percentile and other stuff which is there on ur website..
2. if u plan to launch any app , do let us know…even if it is a paid one i dont mind paying..
No app is in plans. Checked IV for MGL on 22.2.18 at 5pm. Its says the IV Is 70 and the change in IV is more than 300 percent. Opened the chart for MGL IV. There the IV is around 17 and there has not been any jump in IV. Am I missing anything here? It was not update yday. Its fine now. Also can we update this page? I want to have IV Rank and IV Percentile separately of CALL and PUT options. Please let me know. I do record instantaneous IV of call and put of only some stocks, its a good indicator. Not possible. Too much clutter. Thank you so much for taking the pain to make this valuable information available. Because at high IV%ile i would like to sell strangles and vice-versa. Also sir, it would be really generous of you to give some more tips on how to use this IV%ile for trading options in NSE. I would consider IV percentile above 70% as high IV. or is there a simpler way in terms of reports from nse? Because you have shorted two option contracts as part of the strategy which take-up huge margin. It doesn’t matter that its a defined risk strategy. I am facing issues with web-scraping NSE option chain since yesterday (table comes out blank – NAN values)…are you facing this too? do you know what could this be due to and possible fix? In the Option Builder utility, does the IV percentile of the underlying is computed real time ? Or it is based on previous day percentile which you publish post 7.30 PM IST? Awesome. I hope you are realizing that your work is a niche work in Indian context. Nobody is daring to look in this critical aspect what you have done it. When there is a big difference between IVR and IVP of a stock, is it true that the IVR is skewed due to a spike in IV ? How does one clean this kind of spikes from affecting IVR ? IVP is more smoother than IVR which can get affected by IV spikes. In some stocks there is a big difference between IVP and IVR. Does this mean the IVR is skewed due to spikes in those stocks ? So is it better to us IVP compared to IVR ? If you want a smoother reading of IV, use IV Percentile and if you want a spiky reading use IV Rank. Just stick to one. Now, please don’t ask me which one is better. Hi Raghu, great tool. I have been searching for a tool like this for some time. However, this tool is not perfect either. STAR’s IV is indicated as 6.34. TATACOMM IV is indicated as 18.65. Can you please look these two up? Based on the comments above, I think you are calculating IV after scraping option prices. However, there is a big problem with that: A lot of times, there is too much spread between the bid and ask (the bid is too low and the ask is too high). Are you using some sort of average between the bid and ask to calculate IV? Keep in mind that sometimes the bid and asks are entered at some time and are not updated by traders even after the stock has moved (these orders will never get filled). I am sure you know that NSE itself does IV calculation. For example, notice the IV column in the link below (https://www.nseindia.com/live_market/dynaContent/live_watch/option_chain/optionKeys.jsp?symbolCode=2587&symbol=FORTIS&symbol=FORTIS&instrument=OPTSTK&date=-&segmentLink=17&segmentLink=17). From what I understand, this IV columns gets updated with the IV of the most recent trade. Can you please consider using just the IV of the nearest out of money as provided by the exchange? The bigger problem is if yesterday’s IV is wrong, the IV rank and IV percentile which rely on past data are also going to be wrong. The IVs are calculated based on end-of-day BHAV copy options data provided by NSE, no option scraping. I use LTP of ATM & nearest OTM option strikes for calculating the IVs as NSE doesn’t provide bid-ask prices in the BHAV copy. In the last week of expiry, the IVs are calculated by averaging the current month & next month expiry IVs. Liquidity is a factor of many things not just OI,so will have to incorporate multiple elements. Will include your ideas when I get to code for it. Thanks for the detailed comments. Much appreciated. I see IVR data for 213 scripts here, excluding the ones in the Nifty and BankNifty, how and why did you choose these particular scripts ? Because there are only that many FnO stocks. hi raghu, IV is showing as zero in many cases. Can you pls check. Hi Raghu, I am a regular follower of your website, as it indeed contains outstanding data and analysis. On this page (IV ranking and percentile), you show current IV vis-a-vis IV’s in the past. Taking this analysis forward, is there any way to compare current IV vis-a-vis HV (historical volatility of the stock) to determine whether the options on that stock seem to be overpriced or underpriced. If you can throw light on how HV’s can be derived and how to make a comparison between IV’s and HV’s. HV is backward looking and IV is a forward looking indicator. They are not comparable for trading purpose. Previous research by me & others has shown that IV always overstates HV (realized volatility). 1. Where do you get HV data from? Is my source correct? 3. Since IV normally overstates HV, but here since HV is higher, what should we infer from this? This is true for some individual stocks too. For eg: Hindalco IV is 34.77, but HV as per NSE site is 49.98. This is being observed across many stocks especially in the April series. The data shown is of 7th May. Kindly update. Can you please explain the reason for the difference in IndiaVIX and your calculations for IV for Nifty. I understand there’s a calculation difference but a discrepancy of 1 to 2 points is significant for Nifty don’t you think? I’m taking only front month options for calculating IV while VIX considers options from next two month expiries as well. Can you please teach us how to calculate IV manually using options data? Hello Raghu – great work! thanks for sharing with all of us. Appreciate it much. Sir, can you please add “Average IV” column (of related stocks) ? or more than 50 , and call option below iv rank 50……. is i am clear ??????? It doesn’t work like that. IV/IV Rank/IV percentile doesn’t tell you the direction of the stock or the index. You need to read up more on IV Rank/IV percentile. and one more question sir …… how should i take call or put options by what time of iv ranks displayed…..
shall i do options based on iv ranks displayed on before day……. Got a question, I suppose you use this data for your trading. So 45DTE the liquidity in the far options seem to be really bad… how do you tackle the spread when entering let’s say a strangle? The 45DTE thing only applies to Nifty and Banknifty options. Liquidity is bad for stock options beyond 30 days. Really awesome work in compiling all this data. Thank you so much for that. I was just checking some of the values. In ACC, IV 26w high is = 38.57, IV 26w low is = 18.33 and current IV is 28.01. IV rank with this should be 47.83 while your data suggest 72.62. I wanted to know if you are using some other technique for IV rank calculation. Thanks in advance. You are right. There was a zero value for IV in my database on one day for ACC due to which it calculated IV rank wrongly. Fixed the issue now. Would like to know if there is any way to grab tick-by-tick IV data of any strike price for any index/stock options? Looks like today’s Suzlon IV is wrong. Can you check? It is not today’s IV.Its 15th July’s. Looks OK to me. Looks like IV on the Nifty and Bank nifty hasn’t been getting updated on ur file past 3 days, churning out the same IV value of 11.70 and 13.14. Yes, thanks for pointing out. It will get reflected in the next IV table update. For some reason the index data was not downloaded and so IVs didn’t get calculated. Can you please clarify why is there a discrepancy in the IV values between the IV rank/IV percentile table, options builder and options algorithm? For e.g. I checked just now (26-6-2018 10:30 pm) and it shows Reliance as having IV of 27.49 in the IV rank/IV percentile table whereas in options builder it is 42.26 and options algorithm has IV value as 41.74. IVs go wonky in the last week of expiry. To smoothen out the values of IVs, in the expiry week I take average of front month IVs & next month IVs in the last week of expiry. What you see on IVRank/IVPercentile table are the smoothened IVs. The IVs you see on Options Builder/Algorithm are only for that particular expiry as they are required to calculate the expected move for that expiry. In essence, the difference in IVs you see will be there for only four days (last week of expiry) in a month and that is a necessary evil. No issue. No body trades Bosch options. So I just fill the previous IV to avoid gaps in data. yes, it seems release of Index data is getting delayed, so was downloading old index data. Now fixed the issue, I hope it will not repeat. Any plans to add Currency options? Hello I would like to ask why is the IV Rank and IV Percentile different here from the options dashboard for Eg. See BankNifty here IVR is 25	and IVP 33.33 whereas in Options Dashboard its IVR 78 IVP 91 the dashboard data is updated on 04:52 PM – 24-07-2018 and here the update time is 24-07-2018 09:11 PM. Please clear this and tell which to rely on. Hi, I am writing this at 11.30 am on 29th July. The IV numbers on this page are as of 25/07 9.22 pm while IV numbers on the Options Dashboard of your beta site are as of 27/07 4.55 pm. Are both these usually not in synch? Should we look at the options dashboard for latest data? Would be great if both data sets are the same but not sure how the refresh logic works. Thanks – really appreciate your work. Is it possible to display call IV and put IV and changes in those values( on eod basis) for individual stocks ?Currently,stock IV is displayed. Is it average of call IV and Put IV of that stock? Call IV and Put IV should be at individual strike level. Stock IVs here are average of put IVs and call IVs. You have stated that IVs are calculated from IVs of At-the-Money and two Out-of-the-Money strike put & call options. When i visited this page i was under the impression that IVs which are displayed over here are stock IVs and they dont have anything related to Options because for each strike price we can get IVs on another webpage so my question is why are you considering ATM and two OOM strikes for calculating stock IVs. Secondly,you have stated IV Rank & IV Percentiles are calculated over last 6 months (26-Week).What about IVs?Are these yearly values or again 6 months.When we say monthly i hope its 21 days.Correct? How can Stock IVs have nothing to with options?. By definition, IVs will always have to do with options. IV of a stock is the volatility as implied by options prices/premium. IVs are calculated on EOD basis using that days options prices & days to expiry, has nothing to do with 26weeks. What i meant was Historical volatility of a stock which has nothing to do with Options.Are you not displaying Historical Volatility over here? No. Its Implied Volatility only. Please check today’s IV of stocks has not update. Thanks a lot Raghu for the data your provided here. Just like High IVP with High IV gives a signal for sell, I wonder which parameters to consider for Buy signal here. Also is it successful to take trades in Futures instead of Options based on these? If anyone can help me for the same, would be a great. No, don’t use futures in conjunction with IVP or IV. This is only for options. I am big fan of yours! I have been following your data for over 9 months. Your work is creating thousands of DIY traders each month. 1. In the page where you demonstrate option Greeks, Is it also possible to add ITM Probability column? 2. Is it also possible to compute IVP / IVR (esp. for indices) on 52 weeks basis as this is a global practice used in western economies. 3. Is it possible to have some analysis/what of scenario to see the effect of IV, stock movement etc. on the future premium. 4. Lastly, do you plan to introduce the currency option data? I’m working on most of the things except the 1st & 3rd part. I was reading in some literature about “volatility of volatility” . Is it possible to also depict the IVP range (min / max) over the duration which was used for computation? Hi Raghu, The Options Dashboard is amazing. Thank you. What a heavenly website page!!! Btw, the symbol ADANIENT is Not showing up on the page strangely. I think it happened after it’s recent share restructure. Please look into it. Also every time the Options Dashboard gives out an information message on some stock crossing 50% in IV Change, the whole page gets refreshed losing any active filter or sorting options. Kindly fix this issue. Is it possible to add one more shorting option on IV itself? How about showing the page as a tabular structure so that we can download to Excel when required. It will be like icing on cake! I will disable auto-refresh and I’m going to add the tabular structure as well. This site contains very useful information. You have done a great work making IV/IVR and IVP available. I have one query though. I was checking IV of Nifty and BankNifty on this site (https://traderslounge.in/implied-volatility-rank-nse-fno-stocks/) as well as on your Options Dashboard (https://beta.traderslounge.in/options). Both sites are showing different IV for the same script. It seems bit confusing for me to consider IV from which site. It will be appreciated if you let me know why IV of the same script is different in both of your sites? I’m changing the whole IV calculating regime. Done on some apps, doing at others. In a while all will be same. Options Dashboard data calculations are based on intra-day while the ones on IVRrank/IVP page is based on EOD data. There are always some discrepancies between intra and eod data which leads to slightly different IVs and IVPs. Use dashboard for intra-day purpose and IVP page for EOD purpose. Don’t mix them together. we are comparing 6 months low and highest IV with current IV . However i feel IV percentile can be greater than 100 . By definition a percentile is 100 groups/bins into which items are binned. So it cannot be more than 100.